The invention of the bow and arrow was a big moment in our (pre)history. These sorts of projectile weapons may have even given us an advantage over other human species, including the Neanderthals. However, most of the parts involved in this sort of fancy technology are organic, like the wood or feathers. As such, it would all rot away long before we get the chance to study them. This also means that the bits which are left behind, like the arrowheads, can be hard to identify. Palaeolithic people weren’t great at labelling their tools. Backwell et al. found themselves faced with this problem. More than a decade ago they found possible projectile weapon tips in Sibdu Cave, South Africa1. At 61,000 years old, these could well be the oldest bow arrows ever. Or they could be something far less interesting2. 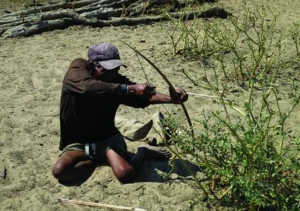 So to figure out what they had, they did the obvious thing and used these ancient weapon tips to help build themselves a 61,000-year-old bow2! 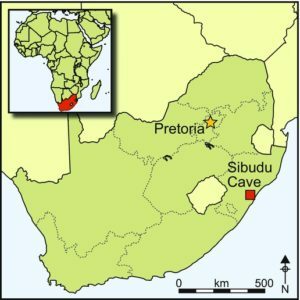 Sibdu Cave is found on the north coast of South Africa and was occupied repeatedly by humans over tens of thousands of years; from the stone age into the iron age. Around 61,000 years ago the area seems to have been very lovely, surrounded by humid, evergreen forests. So some people made camp in the cave, gathering around fires, telling stories, and making themselves some tools1. One bone implement made back then survived until the present1. It was a projectile point, manufactured by whittling down an animal bone into a cylindrical point, Backwell et al. noticed that its design is very similar to the bow arrows used by modern San hunter-gatherers living in the region. Could this point also be the remains of an arrow2? So Backwell et al. enlisted the help of a San hunter, named //ao ≠Oma. He helped them make a traditional bow, used with arrow points like the one from Sibdu cave. They also made themselves some of those bone-tipped arrows, matching the 61,000-year-old version as closely as possible2. Armed with this combination of a modern hunter-gatherer weapon equipped with ancient hunter-gatherer ammunition, //ao ≠Oma set out on a hunt. He took on the most dangerous game of all: experimental rigour. Backwell et al. strung up an goat carcass, which //ao ≠Oma shot dozens of times with his ancient arrows from various distances and angles2. As a control, they also looked at other forces that could damage an arrow, like trampling or burning, to see what traces they might leave behind2. Which would be more similar to the Sibdu point? It turns out that the Sibdu point has damage consistent with being burnt and abandoned. Which makes sense, given the were found in a stone age fire pit. But that doesn’t mean these weren’t arrowheads, because it turns out they contain extra damage on top of that from burning. This damage was similar to those seen in the arrowheads //ao ≠Oma shot the goat with. This gives us a glimpse into the life of the Sibdu point, and the people who made them. It shows that this bone was both hunted and burnt, probably at a low temperature. It seems that they took these arrows out for hunting, successfully killed an animal and brought it back to camp for dinner. Then, something happened to drop the arrowhead in the hearth, where it was burnt. Given the burning seems to have happened at a low temperature, it probably didn’t fall out during the cooking process when the fire was raging. Maybe, after dinner was finished cooking, someone took a bite out of their kill and found the tool; throwing it back into the now dying fire in annoyance. We might never know the exact history of the Sibdu point, but one thing does seem clear: it was used as an arrowhead. Or was it? The oldest bow and arrow? Backwell et al. discovered that the Sibdu tip has damage from being used as a weapon, as well as from trampling or burning. They did this like good scientists, comparing weapon tips to control samples damaged in other ways. However, they were using no such controls when it came to the sort of weapon the Sibdu tip was. They were only testing it in bow and arrow form. Maybe using these bones as spears or darts would produce similar damage. It’s clear we have some very old projectile weapons in Sibdu cave. And the balance of probability is that they’re a bow and arrow, given how similar the patterns of damage are. But we can’t say that for sure just yet. Not without more research and controls. Which is great for Backwell et al., as they get to squeeze more papers out of the subject. And at the end of the day, that’s all a scientist asks for. Backwell, L., d’Errico, F. and Wadley, L., 2008. Middle stone age bone tools from the Howiesons Poort layers, Sibudu Cave, South Africa. Journal of Archaeological Science, 35(6), pp.1566-1580. Backwell, L., Bradfield, J., Carlson, K.J., Jashashvili, T., Wadley, L. and d’Errico, F., 2018. 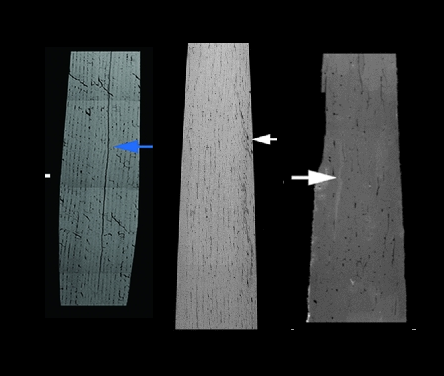 The antiquity of bow-and-arrow technology: evidence from Middle Stone Age layers at Sibudu Cave. antiquity, 92(362), pp.289-303.